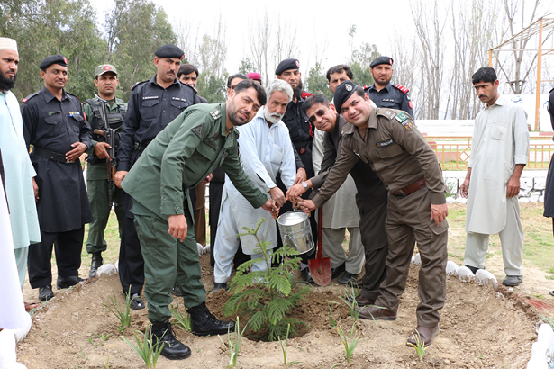 An event on launching of ‘Plant for Pakistan Campaign’ and celebration of ‘International Day of Forests, 2019’ was held on March 27, 2019 at FC Head Quarter Swat jointly by Environmental Protection Society (EPS) and Frontier Constabulary (FC) Kanju Swat. Purpose of the event was promotion of clean and green environment. The event was attended by representatives from Pakistan Army, FC Officers and other staff members, Rescue 1122 and EPS. Mr. Akbar Zeb-Executive Director EPS was the chief guest on the occasion. Mr. Ikramullah (DO FC) and Mr. Imran Khan (representative of 1122) had a detail speeches on the occasion. Chief guest Mr. Akbar Zeb in his speech highlighted the importance of forest, its water storage capacity which we get in the shape of natural springs and wells in the form of fresh water. He also told the participant that due to illegal cutting of forest, we are facing climate changes threats and our glaciers (being the source of fresh water) are now diminishing and ground water level is downing day by day. Due to these reasons, it is of utmost importance that we should protect our forests and plant new trees to protect the safe future of our new generation and to enable their access to fresh water resources. On this occasion, the Chief Guest handed over 400 plants to DO FC Ikram Ullah Khan for plantation. At the end of event, these plants were planted by the participants.